SolveigMM Video Editing SDK / Re: Video Editing SDK!! SDK supports editing of growng TS files. Live editing is also coming, please contact us for more questions to tech support. We started Black Friday action, so hurry up to get Video Splitter and other products with 50% discount! We have developed HTML-5 cloud video editor as a web analog of SolveigMM Video Splitter. Solveig Multimedia, a leader in video editing and customizable multimedia, is happy to announce the new edition of the SolveigMM Video Editing SDK. With 12 years of continuous development under the belt, the SolveigMM Video Editing SDK has enabled a plethora of video/audio software developers to deliver universal editors factoring in a wide range of video codec types like HEVC, AVC, MPEG-2 Video, Windows Media, DivX, etc., and multimedia formats (AVCHD, MP4, MKV, MOV, FLV, WEBM, MPEG-1, MPEG-2, ASF/WMV/WMA, AVI, MP3, WMA). The SDK encompasses DLLs, COM objects and DirectShow filters, Visual C++, C#, VB.Net, VB 6.0, Delphi sample applications, a developer reference manual and API. The SolveigMM Video Editing Engine supports trimming/cutting with Frame or K-Frame accuracy, multiplexing video and audio streams, de-multiplexing inputs to elementary video/audio, re-multiplexing one format to another, file merging, muting particular audio fragments without re-encoding, and more editing operations. HEVC video trimming and joining. Available with TS, MP4, MKV formats containing HEVC video codec. Other unveiled sample functionality includes: editing of growing TS media files, seamless playback of XTL timeline in Direcshow, Extended Batch XTL file format version 2, multiple files trimming, and other. The new version for the SolveigMM Video Editing SDK is also available for 64-bit Windows OS. The developers of DVBViewer have employed the new SolveigMM engine to deliver DVBViewer Video Editor, a chargeable enhancement to their flagship tool: www.dvbviewer.com. The editor supports all popular video standards from MPEG-2 and H.264 up to HEVC. It’s designed to automatically detect and remove commercial breaks in a snap, and effectively cut any unwanted fragments without jeopardizing authentic video quality. DVBViewer Video Editor inherits the SolveigMM lossless approach to output quality, keeping original audio tracks, subtitles and teletext intact. “DVBViewer Video Editor caters to various customer groups, and thanks to the SolveigMM functionality, it enables visually and hearing impaired users to cut off commercials without renouncing essential information”, comments the chief developer of DVB Christian Hackbart. Founded in 2003, Solveig Multimedia has been a leading manufacturer of digital audio, video and multimedia solutions for end users and professional developers. The SolveigMM product line includes Video Splitter, HyperCam, Zond 265 and AVI Trimmer + MKV. Sorry for delay this week it's state vacation in Russia. You'll get reply tomorrow. Solveig Multimedia, a leader in video editing and customizable multimedia, announces a new edition of its Zond 265 – HEVC Video analyzer, version 4.1. Solveig Multimedia and its partner nablet will showcase the new software and functionality at NAB Show in Las Vegas on April 9–12, 2018 (booth SU13713). For over five years, Zond 265 has been the best-in-class tool for analyzing the 'High Efficiency Video Coding' (HEVC/H.265) standard. SolveigMM empowers software developers with a HEVC bit stream analyzer – instrumental to design and implementation of H.265-compliant codecs. The software reveals NAL information, frames types, frames sizes, time stamps, decoding/display order counters, bits distribution between frame elements, coding units data and more details. Zond 4.1 now supports the Netflix's Video Multi-method Assessment Fusion (VMAF) metric for quality estimation. The software leverages VMAF to compare an original YUV file with a preloaded video file. Correlating with human perception, this metric enables more precise video assessment after compression. Since relying on manual visual testing at all times proves unrealistic, VMAF attempts to address the issue by utilizing samples from Netflix content to help design and validate the algorithms. SolveigMM Video Splitter / Re: No DTS/AC3 internal codec? You are right, we don't ship audio decoders due to lisenses issues, as its really hard to obey all license fees for 50 bucks product. So you can preinstall the codecs from free codec packs, and portable version should use them I believe. SolveigMM Video Splitter / Re: Support for HEVC x265? At the moment we are improving HEVC editing itself, and as it is not released yet MKV was not added as well. PLease give us 2-4 months and you'll get it. Hi Hobedtor, it's good idea about scene changes and many thumbnails lines . Meanwhile i'd suggest to use timline zoom, to better find the right scene. frame mode zoom is also available. 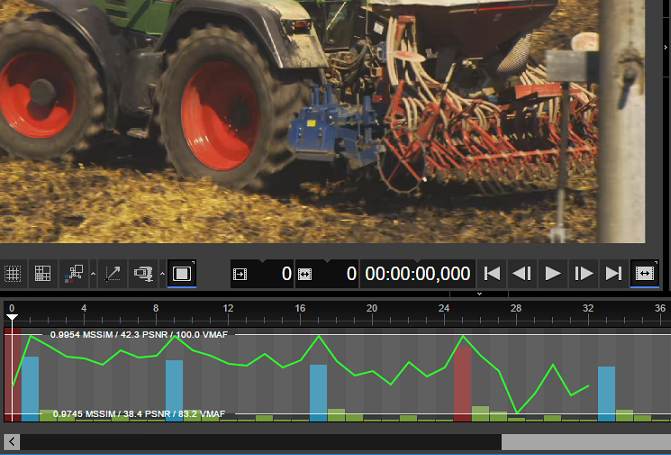 Could you show at your scheme start-stop frames you set cutting cues to? SolveigMM Video Splitter / Re: How to switch OFF "frame accuracy Smart Mode)? Are you sure you use oficial version from our web site? If you download it from 3rd party sites it can be hacked and viruses can be there. In case you are interested in smart editing of HEVC MP4, Transport Stream files with our SDK, we prepared some preliminary demo. please test it and send us your feedback/questions. Here is updated 64 bits SDK to support MP4 with HEVC frame accuracy editing. for testing please use command line tool SMM_BatchSplit.exe. Sample of trim.xtl to feed to SMM_BatchSplit.exe.